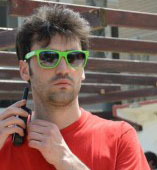 Claudio Brenna is 26 years old, and works as a researcher consultant in p ublic transportation. He discovered Tchoukball as a high school student volunteering as a staff member in the 2006 Tchoukball Beach Festival edition. In 2009, he became the main coordinator of the world biggest Tchoukball event. In this interview Claudio explains to us what are his motivations to manage the Beach Tchoukball Festival, and why he wants to create more than just a Tchoukball tournament. Next episode: Jitka Vele, of Czech Republic.